There are many things YOU can do to promote the space program. Call your Senators and Representative at 202-224-3121 and tell them you do not want to surrender our leadership in space--and indeed America's future as a high tech employer--to China and other nations. Encourage your members of Congress to speak out on the issue--being silent because someone might object to the relatively minor costs will chain America to the ground while other nations leave us in their dust, both technologically and economically. Call the White House at 202-456-1111 with the same message. Urge the president to put us back on track establishing a base on the moon--so we can learn how to live on Mars--and go to an asteroid in this decade. Then go to Mars as soon as possible afterwards. 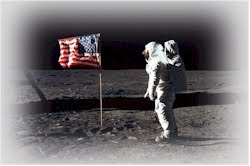 Contact the 2012 presidential campaigns and encourage the candidates to support a space program which will take Americans to the moon and an asteroid in this decade, and to go to Mars as soon beyond as is safe and practical. Just like President Kennedy did, one man can lead America back to greatness! Talk it up with your friends and online. Encourage everyone to do the same. Blog it! Get the discussion going on Facebook and Twitter and everywhere else you go online! Spread the word that the benefits far exceed the costs. The computer and smart phone you use today had its origin in the space program. Same with medical breakthroughs like pacemakers, and so many more things which make our life better every day. Now imagine the breakthroughs in clean, cheap energy and environmental protection we will discover from learning how to live for years in mobile home-sized habitats far from Earth! Space exploration is an investment in our future and prosperity. Jobs, jobs, jobs! A strong space program will provide well paying jobs for Americans just like it did in years past. Pass the word that space means jobs! Call talk shows to encourage more people to take action. Nature abhors a vacuum. China, Russia, India and other nations will attract investments in space--and reap the rewards in jobs and inventions if we sit on the sidelines and merely watch. Pass the word we need to get back to leading in space. What of the costs? Help others understand the costs vs. benefits and the tiny part of the budget that NASA has--less than one cent on the dollar. More is spent (about $20 billion) just to air-condition tents for our troops in Iraq and Afghanistan than the entire NASA budget! We strongly support our troops, but that's an example of how little NASA gets for the incredible benefits returned. Together we CAN get back on track in space and not surrender our jobs and economic future to other nations!